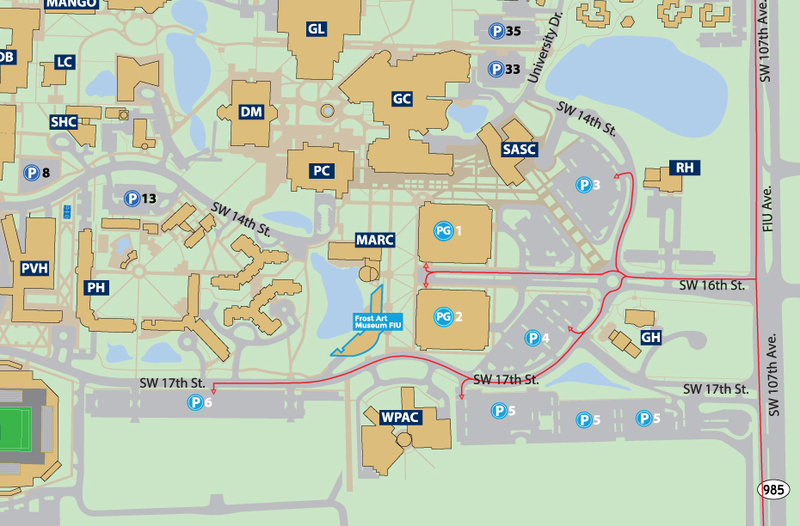 When navigating to the Frost Art Museum, enter the FIU Modesto A. Maidique campus from the 107 Avenue entrance. Guests to the museum must park in metered parking spots in the Blue or Gold garages (PG1 and PG2 on the map) or in additional Lots 3-6 (P3-6 on the map). Guest can pay for parking with the Pay by Phone app or at the meter located in the Blue Garage. For more information, please feel free to contact us at 305-348-2890 or at artinfo@fiu.edu. Guest must park in the metered parking spots only in these parking locations. The museum is located behind the Blue garage.